Shortly after Gregory was born, I went a little crazy at the Black Friday Joann's flannel sale. I haven't let myself buy flannel since then and I am finally using a bunch of it for our second child. Remind me to hide the bank card when this second baby comes - the things you do postpartum defies logic sometimes! Anyway - I made a bunch of large, double-sided receiving blankets. They are great for swaddling, covering the car seat, and bundling your little one - I hate the store-bought ones - they are too small and flimsy. I made three gender neutral ones, three girly ones, and two boyish ones. I plan to give some extras away. Making 8 receiving blankets was boring with a capital "B." But I know I am not really mentally available right now to tackle anything that requires a lot of thought. I considered making a wall hanging with the fabrics pictured below but the design I have in my head might be too complicated for my 9 months pregnant self right now. I love all of these fabrics together - I am hooked on the combination of pink and blue. I don't expect to get very far but I thought it might be nice to "decorate" my design wall instead of being taunted by a very empty space once the baby comes. Rebecca made the baby the most amazing quilt. I can't believe how creative this design is - I seriously think she should enter it into some contests because it is so well done, unique, and modern. Look how she represented clouds, the sun, a blue sky, and grass: This bear is to die for. I will always think of her when my baby uses it - it not only has a Momo fabric but she bound it in a Joel Dewberry woodgrain fabric - a fabric she absolutely LOVES. She also made this matching white shirt with an appliqued and emroidered bear. It is so sweet. Alexis made this adorable penguin which Gregory immediately laid claim to. "It's mine" were the first words out of his mouth when he saw it. I love handmade softies. Amy made these adorable booties for my little one. I have seen this pattern around blogland but have never had the courage to try it myself - they're so itty! I am SO excited to use these- the gender neutral fabrics are perfect. Jane made these sweet drool bibs - there is no way I am using them for food. She quilted them and everything - so, so cute! Alice made these adorable burp cloths - she knows me too well with having used some prints from two of my favorite designers: Ann Kelle and Laurie Wisbrun. Aimee made me this adorable diaper carrier and burp cloth set. You can never have too many of any of these. I love the Heirloom prints she used especially! On Saturday evening I went out for a much needed "girl's night out" with friends. My good friend Liz presented me with this gorgeous knitted blanket. I just love it - pictures do not do it justice - it is SO soft! I am amazed at her talent. I would be so happy if the baby "attached" to this blanket or Rebecca's bear blanket because they've come from meaningful friendships. Thanks for sticking around for this long post. For many of the projects, my friends blogged about them and included links if they used a tutorial. Most of you reading this can probably understand why receiving handmade gifts is so special. Sometimes people think that I wouldn't want anything handmade because I sew - but if anything, I think I have a deep appreciation for what other's create and I understand that it takes a lot of extra thought and work to make something special for a friend. My baby is very lucky! The boy sleep sack is finished. I am very happy with how it came out. I think this is one of my "all time" favorite projects to do. 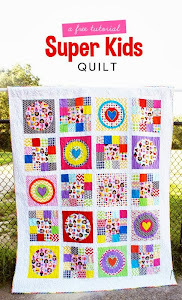 I love using the nicer "designer" flannel (all other flannel projects that I do are always sourced at Joann's), I love the patchwork panel, and the end result is just so sweet. We'll see how truly functional it actually is soon enough. I used a pattern from Anna Maria Horner's Handmade Beginnings. I can't believe I almost bought more flannel for the lining when I was truly only a few inches short. I took Jenny's advice and pieced a few parts to make it work and of course - you can't even tell because it's all the way inside the bottom of the sack. I know the real reason why I was worried about this issue, and it wasn't about cosmetics: I was simply feeling lazy and was super annoyed that I couldn't just cut out the piece without extra fuss. I bought this flannel ages ago to make a receiving blanket but never got around it - it's a Robert Kaufman fabric but I can't remember the name. I used one of my favorite Joel Dewberry woodgrain fabrics for the bias edging. 10 more days till my due date! These are definitely some of my favorites. Those penguins with hats and scarves? I die. I am also in love with the Remix coordinates she sent. These will be great for any Christmas project but we all know it's hard to find true red and green fabrics - so I am sure we will be seeing these popping up in lots of projects. Thanks so much to Kelle for sending these. Thankfully, she was understanding of my my 38+ weeks pregnant status and I have plenty of time to create a quilt. I can't wait to get started though - this will probably be my first post-baby project. Thanks for all of the kind comments regarding my pink spiderweb quilt! Lately, I have been looking back at the things I have made lately and my only thought is, "How on earth did I have the energy to make that?!" I really hit a wall today - I can't really envision doing anything besides taking care of my son for the next few weeks. I have really hit a wall with this pregnancy - I am so done! Anyway - I had a small burst of energy yesterday and was able to piece this patchwork rectangle for a boyish sleep sack. I soon learned that I don't have enough flannel for the lining and I am wondering if I should just order a coordinate or piece together a piece big enough that would work. I am not excited about waiting for a fabric order (or spending the money when I was determined to sew completely from stash), nor am I thrilled with the prospect of piecing together the flannel - which has a large scale print and will not look very good being spliced together (but no one is really going to see it anyway because it would be on the inside of the sack.....). I finished this quilt over the weekend and I am very happy with how it turned out. I used a lot of pink scraps and about 1.5 yds of Sherbet Pips ice cream dot. It measures about 40" square. Even though I had issues with doing pebble quilting, it was fun to do a new technique and I love the look and texture it provides. I am glad I decided not to quilt the pink spiderwebs - it makes them puff up, which is kind of fun. All of the seams within the blocks make for some very thick fabric areas that would've been very difficult to quilt through. 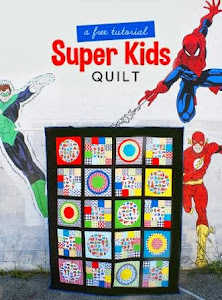 I am entering this into the "Scrap Attack Quilt Along" at Stitched in Color. I backed the quilt in some minkee I had had in my stash for ages and bound it with a reproduction stripe that I am happy to have finally put to use! I've always liked the look of "pebble quilting" but have never wanted to utilize the technique on a large quilt simply because of the significant time commitment. But I figured I could handle doing it on a small quilt: Well, the stupid technique ended up breaking my free motion foot. I was humming along - doing the pebbles on the border when the quilt suddenly would not move under the foot - it was horrible. It took nearly a week to figure what had went wrong (and I tried all sorts of "fixes" to see what had gone wrong - a new needle, re-threading the machine, using the foot on a different fabric/batting combo, etc.). When my mom came over on Wednesday, I had her bring over her free motion foot and I compared hers with mine. Turns out that I have used the foot so much that it simply wore out and the pebble quilting was the last nail in the coffin. There are two large spots where the chrome is worn off and it is obvious that the spring has lost its ability to "bounce" very fast at all. I am glad that it only costs about $14 to buy a new foot and very relieved that I wasn't facing an expensive and inconvenient mahcine repair! This experience made me think of my dear friend, Monet, who literally broke her machine beyond repair when she did pebble quilting on a baby quilt. She really had to argue with the store she'd purchased the machine from - insisting they honor the warranty she had had. They tried to give her back the machine when it still wouldn't do any free motion quilting - but she fought back and won - and they ended up replacing her machine! I whipped this "Baby Changing Kit" (thanks to an easy tutorial from Cluck Cluck Sew) in about an hour. Apparently the Joann's near me are not carrying chenille, so I used the leftover red Minkee from the Plus quilt for the interior of the kit. I like how well my little diaper bag ensemble has come together. I used the bag for a morning at the Boston Children's Museum this week and it worked perfectly for my needs.